US President Barack Obama has celebrated Diwali by lighting the first-ever diya in the Oval Office of the White House and hoped that his successors would continue the tradition. 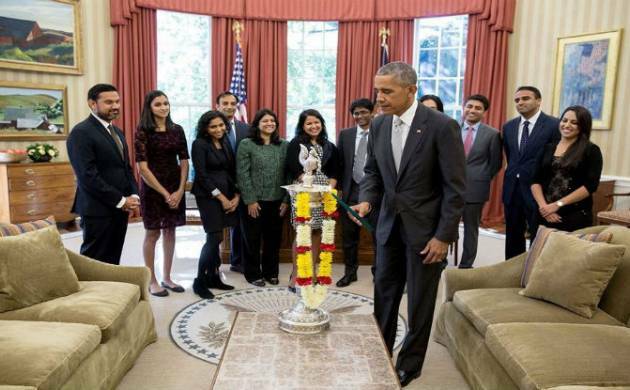 Obama, who was the first president to celebrate Diwali personally at the White House in 2009, talked about this momentous occasion in a Facebook post soon after he kindled the diya in his Oval Office with some Indian-Americans working in his administration. “I was proud to be the first President to host a Diwali celebration at the White House in 2009, and Michelle and I will never forget how the people of India welcomed us with open arms and hearts and danced with us in Mumbai on Diwali,” Obama said. “This year, I was honoured to kindle the first-ever diya in the Oval Office—a lamp that symbolises how darkness will always be overcome by light. It is a tradition that I hope future Presidents will continue,” Obama said on the White House Facebook page, which became viral on the social media. “To all who are celebrating the festival of lights across America and around the world, happy Diwali. As Hindus, Jains, Sikhs, and Buddhists light the diya, share in prayers, decorate their homes, and open their doors to host and feast with loved ones, we recognise that this holiday rejoices in the triumph of good over evil and knowledge over ignorance,” said the US President. Democratic presidential candidate Hillary Clinton, who has a large fan following in the Indian-American community greeted Hindus, Sikhs, Buddhists and Jains across the world on the occasion of Diwali. “On Sunday, nearly a billion Hindus, Jains, Sikhs, and Buddhists around the world—including more than two million Americans—will celebrate Diwali, the festival of lights. For members of these faiths, lighting the lamp (the diya) is a reminder that light prevails over darkness, knowledge over ignorance, and good over evil,” Clinton said.